As I was cooking massaman curry yesterday afternoon, the smell of rich, creamy coconut milk, mixed with a slight cinnamon scent, cozy cardamom, tangy tamarind, and roasted peanuts wafted into my nose, sending me whirring down the Bangkok Skytrain to the National Stadium station where off a narrow soi, sits a tiny restaurant, Pisces, where my fondest massaman curry memories lie. I had only been in Bangkok for a few weeks when I met two other expats who had also just begun teaching in Thailand, one from England, Mariha, and one from Trinadad and Tobago, Neal. Neal was in my same CELTA class where we were learning how to teach English, and he had met Mariha at the common room of their hostel. We all bonded immediately, glued together by our love for exploring and living in a country not our own, teaching Thai kids, and discovering new Thai food every day. Those first few weeks we ate Thai food together almost every night, and we loved Pisces, which was right down the soi from the hostel where my friends stayed. Every time we went, we would always order our favorites: the crunchy, yet soft spring rolls with a sweet, spicy sauce, massaman curry, and sometimes throw in something new, but those were always our staples. We would sit on the dark green plastic chairs outside and chat about our teaching dramas in the darkening night, as the humid air wrapped around us, and mosquitos lazily tried to bite us. Then right as our stomachs began to loudly growl, the server would bring out the pipping hot, steaming massaman curry. After serving each other jasmine rice on the small blue plates, we would share the spring rolls, other Thai dishes, and massaman curry. I loved to savor the creamy, coconut broth with peanuts, chicken and potatoes, which always reminds me of Indian curry with a Thai twist. Over spoonfuls of heart-warming Thai food, we would talk about friends we missed from our home countries, wonder what the Thai beach would be like we were traveling to that weekend, and which cheap, pirated movie one of us had recently bought from the street that we should all watch later while eating chocolate from 7/11. I love how food brings people from all over the world together. 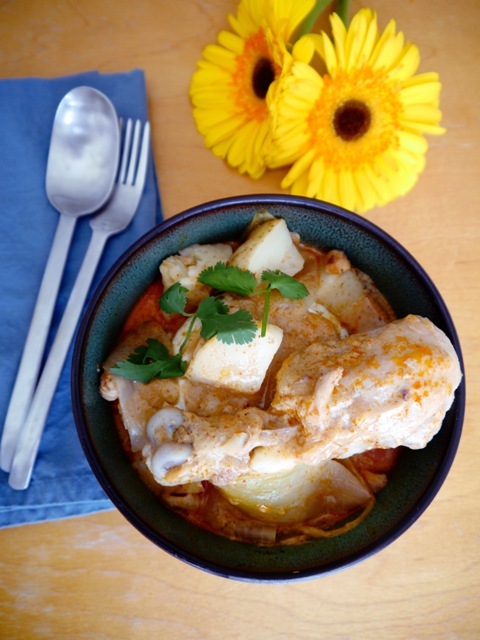 Even in my home in Austin, yesterday we tested out my massaman curry recipe with friends we had just met, and with each spoonful, we savored every bite of food and new friendship. If you like Indian and Thai curry, you will love masaman curry! 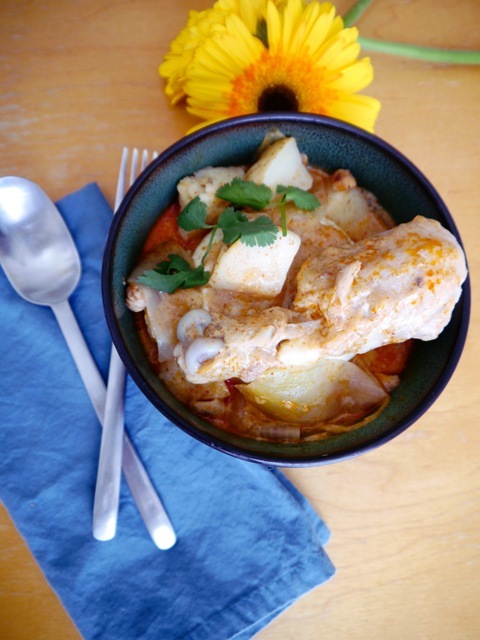 The comforting spices and cozy coconut milk with chicken and peanuts will brighten your day! Add cooking oil to a large pot. Once oil is warm, add the massaman curry paste. Stir it until you start to see the paste separate some and the oil change to the beautiful golden red curry color. Be careful not to shake your coconut milk, so you can scoop off only the top of it, the coconut cream, into the pan. Stir with the curry paste until it starts to bubble up and look like reddish orange melted marshmallows. Add the chicken to the pot, and mix it up with the coconut curry paste. Add the rest of the coconut milk, and enough water to cover the chicken. Let the curry simmer for about 10-15 minutes or until your chicken seems like it is about halfway through cooking. Keep peeking at it, and adding water if you need to. Add the potatoes and onions to the pot. FYI, if you add the veggies, too soon, they can get mushy, and if you add them too late, the chicken can be falling off the bone before the potatoes are done, so this can be the trickiest part of the process! I'd rather add them too late, and have the meat falling off, than too early and have mushy potatoes, but even if either happens, don't worry, your curry will still taste delicious! Once the chicken is cooked through and the potatoes are fork-tender, add the peanuts. Then taste the curry. Add tamarind paste, sugar, and fish sauce to your liking. I like mine more sweet and sour, but do what you prefer. Serve in bowls with a platefuls of jasmine rice. Enjoy! Beautiful photo of this Thai comfort food! We’re posting a fusion dish with massaman I have a feeling you’ll like soon. Thanks Dwight for your kind words! Let me know when you post it! I’d love to check it out!